I think there is only one word to adequately describe Keukenhof: WOW! Known around the world for the spectacular display of spring bulbs, Keukenhof puts on a massive show every spring. An incredible seven million bulbs are planted for the yearly extravaganza which lasts only 8 weeks from mid-March to mid-May. During this time, the gardens are inundated by masses of visitors from across tulip-crazy Netherlands and from around the world. Self-professed as “the most beautiful garden in the world”, it sets a high standard but doesn’t disappoint. Keukenhof has managed to achieve world wide fame through complete dedication to spring bulbs, in particular the tulip. However, I think that what really sets the garden apart is the perfect background it has created to really bring out the beauty of bulbs. 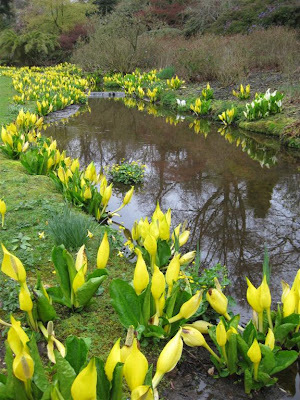 The whole garden is set in gently rolling woodland, underneath huge trees just leafing out in crisp new leaves during tulip season, through which filtered sunlight perfectly illuminates drifts of bulbs with incredible colours. 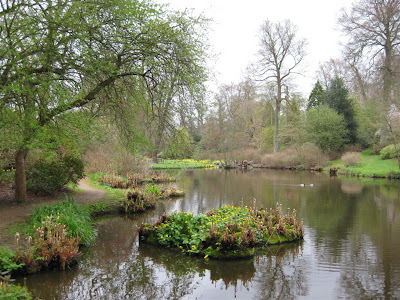 A small lake, meandering streams, naturalized bulb areas and a Japanese garden complete the picture. And to top it off, the entire garden smells incredible - it's like being in a flower shop the whole time without being overwhelming. At 32 hectares/80 acres, the gardens are surprisingly large, and it takes at least a few hours to make it through everything. Although all planting beds are spring bulbs, and the vast majority of bulbs are tulips, somehow the carefully orchestrated arrangements continue to amaze throughout the garden. It’s impossible not to take pictures at every turn – it’s embarrassing how many we took, but it's hard to control oneself. Apparently, Keukenhof is also the most photographed garden in the world, so we’re not alone. And just in case you still have space on your camera memory card, there are many other premeditated photo-ops in the garden, including the giant Dutch clogs, the turning windmill and walking on water pictures. Keukenhof is the Disneyworld of gardens! The one tip I must pass on about Keukenhof is the crowd. In the 8 weeks they are open, they get an astonishing 700,000 visitors! We got there at 9am, which was one hour after opening, and already there were a lot of visitors. Luckily, the paths are generous and the gardens large enough to accommodate quite a few people without detracting from their beauty. Early in the day, you can appreciate the impeccable views, the perfectly staged vistas, and enjoy the overall feeling of the garden. By noon, the garden was really filling up, and by 1pm it was absolutely ridiculous. It was almost impossible to move along the paths, and instead of the beautiful vistas that greeted us when we entered, the primary impression was that of many, many people with cameras. And outside the garden, there was a 2km long car lineup waiting to get in. I suspect that the magic of the garden is somewhat lost if you spend a few hours in a car lineup, a few more hours fighting through crowds to actually see anything or sneak a picture, and a lot time waiting in bathroom line-ups, for which you also have to pay. Overall, Keukenhof is an unforgettable, once in a life time experience that overwhelms the senses with the spring bulb experience, especially tulips. Just get there before the crowds to fully enjoy the beauty and spirit of the garden. Where: Just outside the town of Lisse, south-west of Amsterdam [Map]. You can buy a combi-ticket on the Keukenhof website which includes a bus from the Amsterdam airport. We took the train, and the closest train stop is Hillegom, about 4.5km away from the gardens. If you rent bikes, it's a pleasant ride in, or a bit of a longer walk through the tulip fields. I would definitely recommend avoiding car travel - only a narrow two-lane road leads to the garden, resulting to long lineups. When: Only open from Mid-March to mid-May (check exact opening times on web site each year). We went last weekend (April 25th), and I think it was perfect for prime tulip display. The weeks before and after are probably good as well. The gardens are absolutely impeccably maintained, so the display is probably great any time during the open period. The Garden Wanderer has finally started doing some real garden wandering! This weekend, I took my first, long-awaited trip to the Mecca of gardens: (enter pompous royal music here): Britain!! For any gardener, the British Isles represent the epitome of gardening – from cottage gardens to large estate gardens, from the famous English lawn to plant hunters who are responsible for some of today’s most popular garden plants, the UK’s roots go far back in garden history. This is definitely the place for gardeners’ gardens: filled with plants, and with keen gardeners. You know that gardening is a national hobby when even the heir to the throne has published a gardening book. Given the hundreds of gardens one could visit here, it was of course very difficult to choose one to start with. The Savill Garden, described (albeit on their own website) as “one of Britain's greatest ornamental gardens” won the prize because it’s only about 1-1.5 hours from central London (depending on your mode of transportation), and is known for its spring display. The garden is 35 acres, and part of the Royal Landscape at Windsor Castle, which includes 1000 acres of gardens and woodlands. 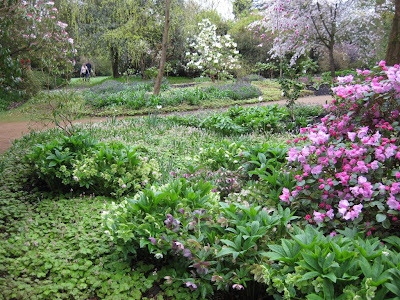 The garden is famous for its spring woodland, rhododendrons, azaleas, spring flowering trees and many, many bulbs. Expectations were definitely high for this garden, and with high expectations there is always the possibility of disappointment. Luckily, I was anything but disappointed. As soon as we walked through the funky new visitors’ center and crossed the small lake into the main area of the gardens, I felt like I stepped right into the quintessential British garden. It was exactly what I pictured after reading and seeing so many spectacular British gardens in books. Even the weather was appropriate - overcast with very light rain, making everything seem even more fresh and green. Everything about the garden was perfectly maintained - all shrubs and trees were impeccably shaped, the lawn was flawless and there was not a single weed in sight. 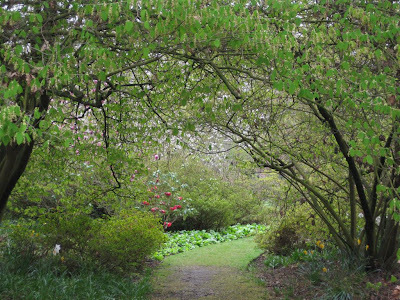 The garden has many areas, but the main ones this time of year are the spring wood and the azalea walk. The opening in the spring wood was spectacular - in mid spring, it was already lush with all manner of bulbs, hellebores and flowering trees. The number and variety of rhodondendrons was also astonishing - everything from tiny bushes to immense trees I didn't even think could be rhodos. The skunk cabbages (they give off a mildly unpleasant odour, but we didn't find it particularly powerful) were out in massive numbers and looked great along the lakes. In addition to the spring wood, there is also a summer wood and summer borders, an autumn wood, a gravel garden and a New Zealand garden. The gravel garden, although it was very early in the year, was looking good, with beautiful euphorbias that made me a little jealous since these varieties aren't hardy in Canada. The New Zealand garden was full with amazing grasses which looked spectacular even at this time of year (grasses usually peak in the fall). All in all, the gardens really lived up to my British garden dream. Spring is a great time to visit, but after seeing all the garden areas, I think it would be a fabulous garden any time of the year. Where: Wick Lane, Englefield Green. [Map] If you're going by public transport, the closest train stop is Egham (about 40 minutes from Waterloo Station in Central London). Thereafter, it's either a bus ride or a bit of a hike by foot (about 45min-1 hr). If going by foot, do not follow the road signs for the garden - they take you the long way around. From Englefield Green, just take Bond Street and King's Lane to cut across straight to the gardens. When: The gardens are known for their spring display. If you want to catch the daffodil meadow, late March to early April is the time. By mid-April when we went (April 11th), most rhodos and spring ephemerals were in bloom. I think a week later may be even more spectacular. There are areas in the garden designed to peak at all different times of the year, so a visit any time is worthwhile. 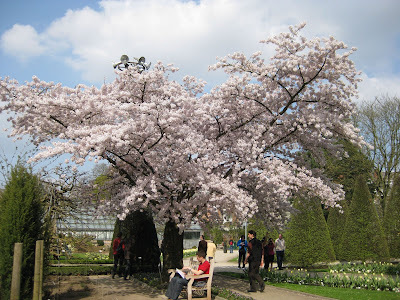 Last week, as I was whizzing around Leuven running errands, I almost fell off my bike going past the Leuven Kruidtuin: the mature cherry tree is now in full bloom, with every single branch covered in gigantic, fluffy white-pink blooms. With the sunlight streaming through, it seemed like the whole tree was a radiant, soft pink cloud floating over the garden. I don’t think I have ever seen so many flowers covering a single tree. It was definitely the star of the show, completely surrounded by people taking pictures or just trying to soak it all in. I have been completely amazed by the flowering tree display here in Belgium. 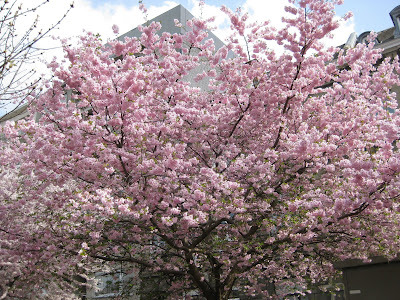 In Canada, we have nice blooming trees in the spring, especially many crabapples, but I have never really seen anything quite like this before. On the side of every road, in ditches and tucked into tiny concrete corners, there are flowering trees just covered with blossoms. The tree below is just on the side of the main ring road around town. There are many others on my way to work every morning, but I haven't managed to remember the camera. 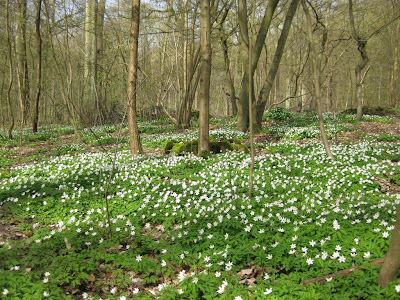 Today we went to Foret de Soignes just outside Brussels to witness the spectacular yearly show put on by wood anemones (Anemone nemorosa). 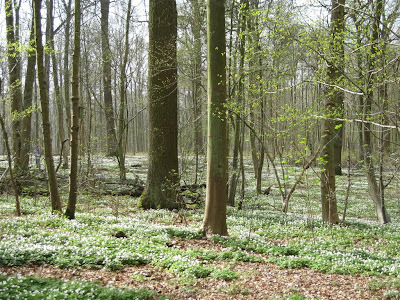 Foret de Soignes is one of the few pieces of old-growth forests left in Belgium. Here, even forests that look natural are generally man-planted and managed. Back in the Middle Ages, Foret de Soignes covered a vast area. Now, it's much smaller by comparison, but at 44 square kilometers, it's still very large by Belgian standards. On a nice day like today, which was uncharacteristically sunny and warm, it's full of walkers, bikers and horse back riders. 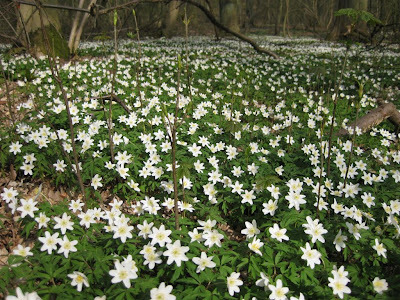 Wood anemones carpet forest floors across Europe every year in early spring, before the big oaks and beech trees start to leaf out. 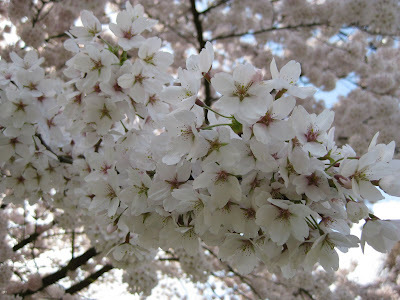 And every year, they put on an incredible show - the simple, pure white blooms are quite beautiful on their own, but when grouped together by the millions as far as the eye can see, they are spectacular. You have to get the timing just right though, because the blooms are very short lived. Once the big trees start to leaf out, the show is over. We couldn't stop taking pictures of them, but I'm not sure if they do them justice. It's hard to also capture the warmth of spring sunshine, the smell of fresh air and the incredibly loud and excited birds. 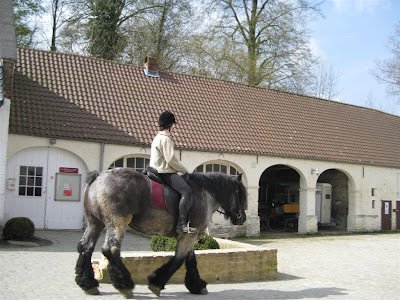 And to finish off the day, you can also enjoy a nice piece of home-made pie at the cafe in the old cloister at the edge of the forest, and check out the horse back riders going through the cloister courtyard. I find everything about plants pretty amazing, from tiny seeds to gigantic trees hundreds of years old. 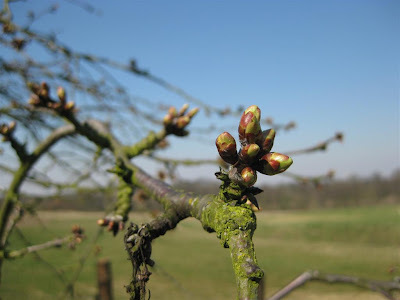 But buds must be close to the top of the list of botanical wonders, and spring is the perfect time to really appreciate them. 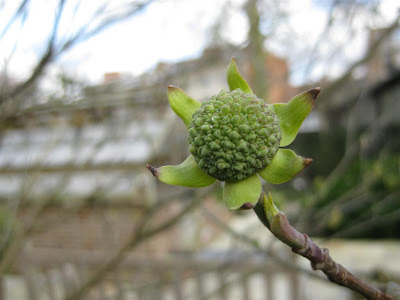 Buds are tightly wrapped packages of tiny leaves or flowers. 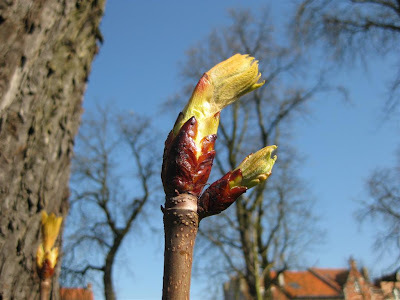 Many plants make buds before the winter, and somehow these tiny living things have to survive extreme winter temperatures, snow, ice and wind before emerging perfectly fresh and unfazed at the start of spring. And buds are not only tough, they're often beautiful, and always interesting. 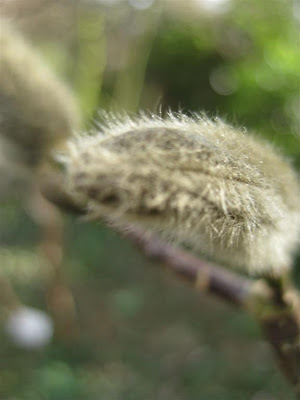 Many people are familiar with big furry magnolia buds, which hang on to magnolia trees and shrubs all winter. We saw a magnolia last weekend with buds at least 3 inches long. The delicate furriness is a protection mechanism – it traps heat and insulates the deeper layers of the bud. 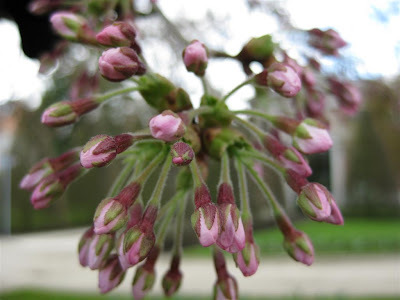 Flower buds on cherry trees are getting bigger every day. This picture was taken more than two weeks ago at our community farm where there are 22 varieties of cherry trees I can't wait to gorge on in the summer. I especially love the moment when little leaves start to emerge from the bud. Perfectly fresh and green, almost transparent and incredibly complex. It’s ironic that these most delicate of leaves have to survive much harsher conditions than mature leaves later in the season.